Nago, Okinawa is a picturesque tourist town. The mountains are lush with tropical foliage; the white-sand beach waters are calm and crystal-clear. 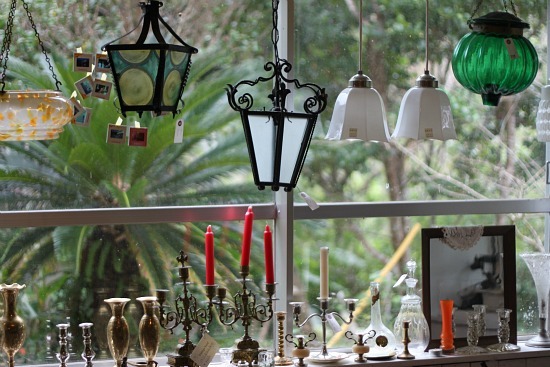 Travel along Highway 84 (on route to popular tourist destinations like Ryugujo Butterfly Garden and the Okinawa Churaumi Aquarium) and carefully watch the roadside for quaint woodens signs reading "Vintage Yard Antique & Cafe." Follow the dirt path off the main road to reach your destination. After parking two friendly dogs greet you and lead you straight to the shop. 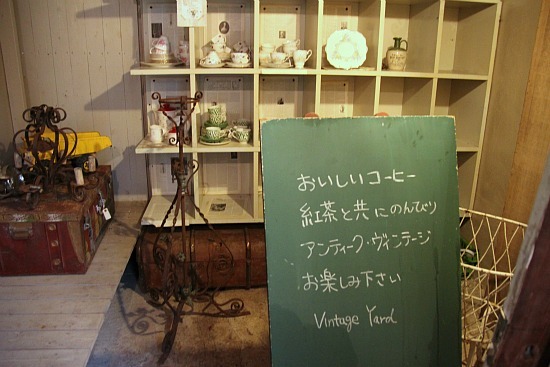 The shop is a rustic, antique house. Two pillars in front of the house are topped with ubiquitous Okinawan Shisa; according to tradition, these lion-dog-like creatures ward off evil spirits. You remove your shoes and put on house slippers before entering the shop just like you would before entering a Japanese home. The courtyard outside has a deck with a view overlooking the mountains below and the beach beyond. 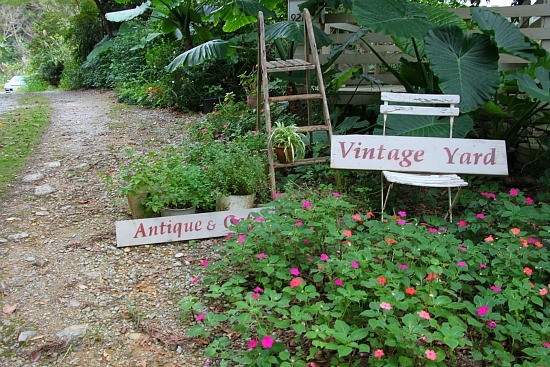 There are various container garden vignettes, signs that read "Vintage Yard", and antiques with aged patina scattered throughout the small property. Slinking around in house slippers you feel comfortable, more at-home. 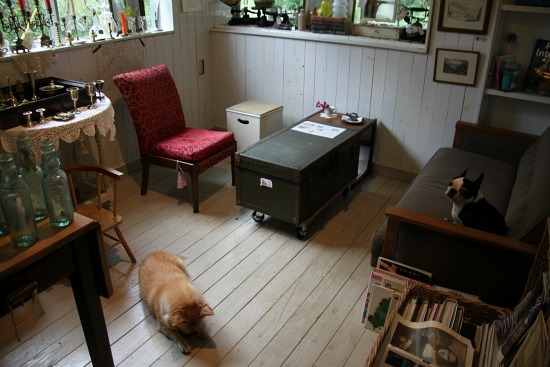 The cozy area pictured above is where you can sit and order from a big menu of treats. 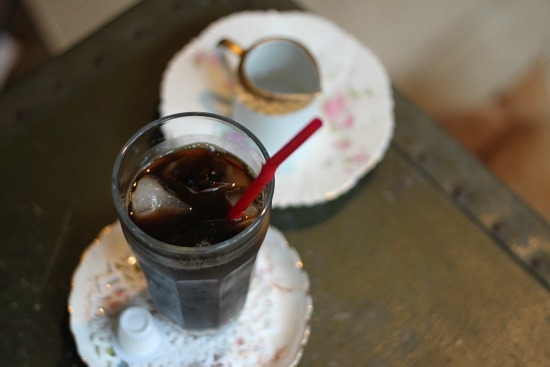 I ordered iced kohi (coffee) which was served on vintage saucers with cream and sugar syrup, then paroused the small shop for over an hour, admiring the details and jaw-dropping displays. 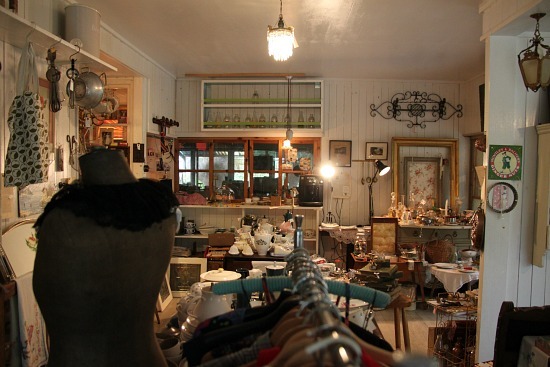 The shop was filled with antiques, yet not too crowded. It was a well-curated space with vintage furniture, clothing, books, kitchen supplies, toys, and more. My friend JR and I sat, petted the dogs, and talked over coffee. As a childhood friend, he said he didn't remember me being big into vintage. That got me thinking. I've always been thrifty and a thrifter, but my vintage collecting escapades evolved more recently. I'm drawn to vintage on an artistic level, it's another form of expression to me. 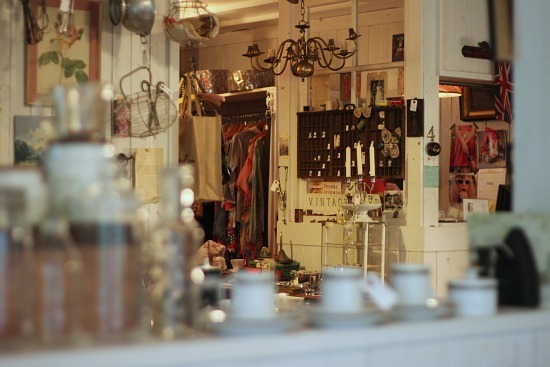 As creatives, we're attracted to vintage for it's scarcity and beauty. I can tell this shop-owner is passionate about her wares. 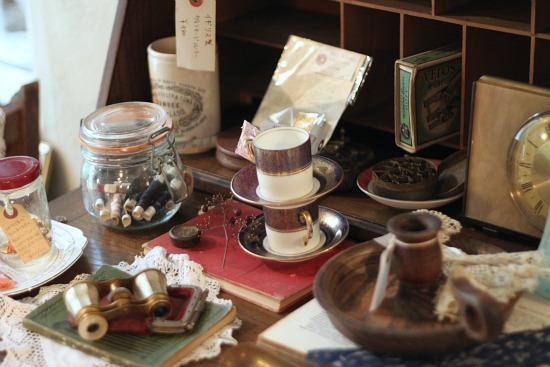 I'm glad to see a global appreciation for well-created relics from our past- and that many people are associating it with cafés and warm feelings associated with "home." Sigh. That was amazing. Almost as good as going vintage adventuring myself. Thank you for taking us along. 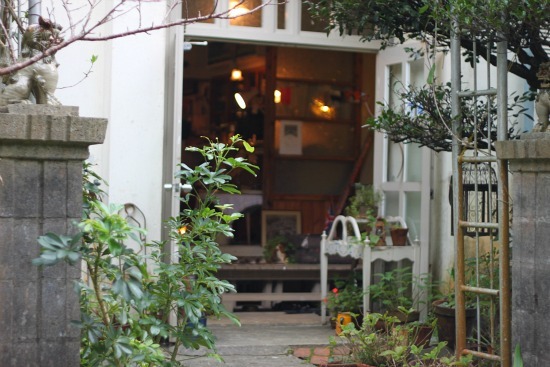 This little shop and cafe looks lovely! Wow, you would never know that shop wasn't in the states. It looks so familiar. I guess vintage crosses all borders. Helen: Glad you liked it. I took so many photos, I'll add them to flickr for everyone to browse through soon! Jackie: It was, I spent a lot of time capturing all the details! Amber: Yep! It was done-up in a western, European flea market style. The house itself had remnants of a shogi screen and other bits to show it was an old Japanese; nice juxtaposition. Oh, I would have asked if i could spend a few days there! It looks like a lovely place, and very peaceful, too! Thank you!! For most kids, Santa already rates pretty highly in their louis vuitton outlet eyes, given the whole presents, elves and magical reindeer schtick. For the kids stuck behind a car crash in Coppell hermes outlet, Texas early last week, the jolly old elf has likely moved to hero status. 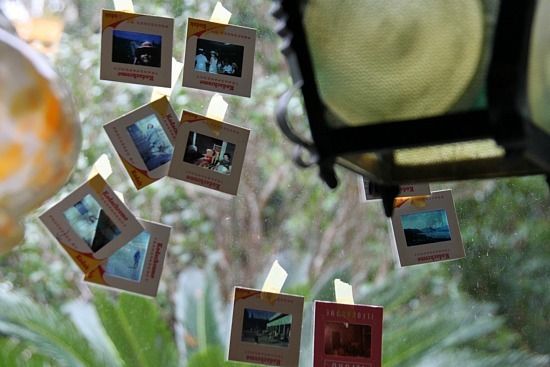 Tag, You're It: What Are Your New Years Goals?